Why hello, December. Are you here already? Pardon me? What do you mean you’re almost over? I know, I know, we’re all busy. But holy cow, has this month ever been a whirlwind. And not even because of Christmas. Okay, well, maybe a little bit because of Christmas, but certainly not because I am in any way prepared. We don’t have a tree. Our lights are up outside, but, grinch-like, we never plug them in at night because it is frakin’ cold out there these days. I mean -30 cold. I bought a timer for the lights but haven’t set it up yet. There are zero decorations inside our house because they are still in boxes buried under the stairs. Christmas shopping is kinda, sorta taken care of but it’s been happening piecemeal here and there like and I have nothing for stocking stuffers. Oh, who cares? You don’t want to listen to be complain. Besides, what am I doing here when I have to go pick up all the clothes strewn all over my bedroom so I can pack my bags for the course I’m taking in Vancouver, flying out tomorrow afternoon and coming home at 1 a.m. on Christmas-for-goodness-sakes-Eve? Oh dear. Really I just wanted to pop on here to say hi and tell you about what we have been doing, because, really, it’s been a pretty awesome month. Crazybusy. But awesome. Let’s see. 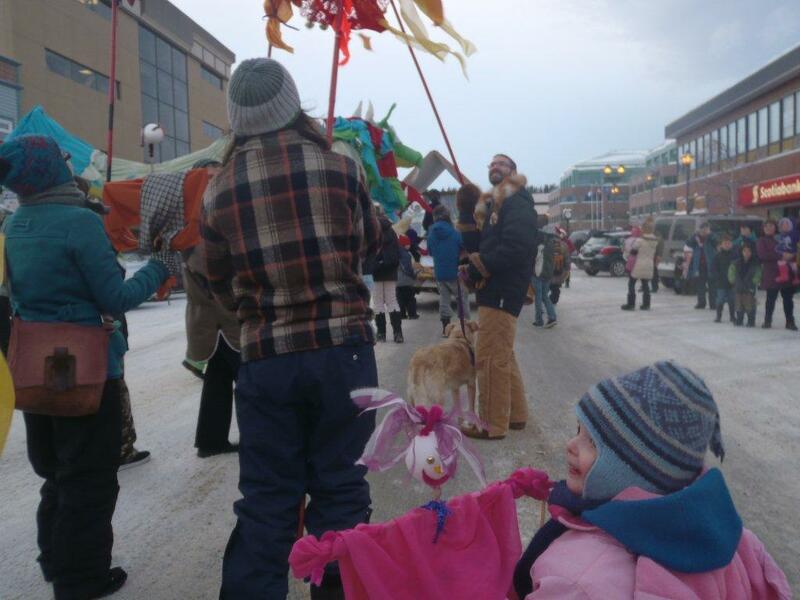 Jade and Halia and Michael and I participated in Whitehorse’s Christmas parade. The girls participated in a free community art project to make “Frollies” (little Christmas spirits) and then were invited to tote them in the parade. So we did. And one of the benefits was that Santa hung out at the headquarters while all the paraders were mustering, so Jade got to spend a good 20 minutes following him around and gawking at him in total hero-worshiping wonderment. Even Nanuq was in the parade! Jade walked the whole way by herself and Halia rode in my amauti. The Big Band (in which I play piano and Michael plays bass trombone) had a concert at the Yukon Government building (which is the building I work at 2.5 days a week). The girls had a marvelous time dancing to swingy Christmas music. The All-City Band (in which Michael plays tuba) played a concert at the government building later on in the week. (They have music all week the first week every December.) The girls were not nearly so attentive that time, so I hardly heard anything while I chased hurricane Halia around. Huge for me: I played a gig with my friend Steve Slade at a local restaurant called Antoinette’s. We rehearsed together every weekend for a month before. We played for two hours to a full house and I’m pretty proud of how it went. 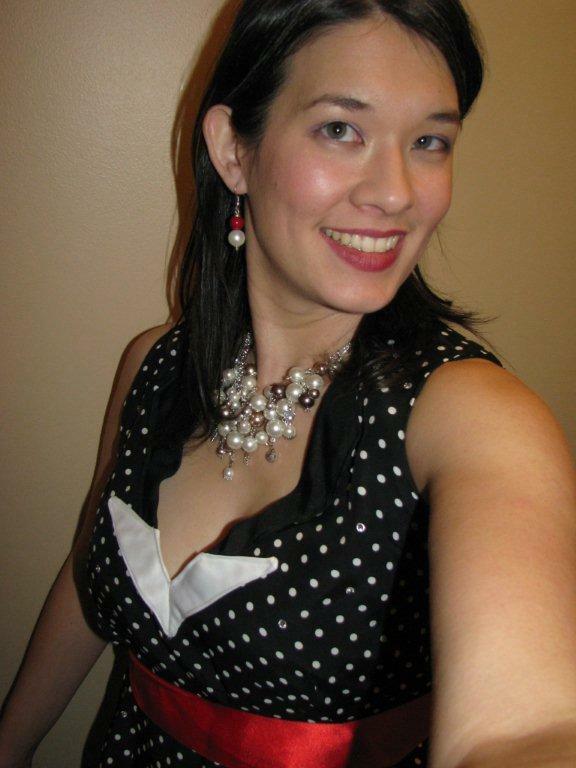 I wore a baubly pearly necklace I made myself and a Sally Ann top I upcycled and my sparkly red shoes and just had a fabulous time. This is how my top started out back in August. 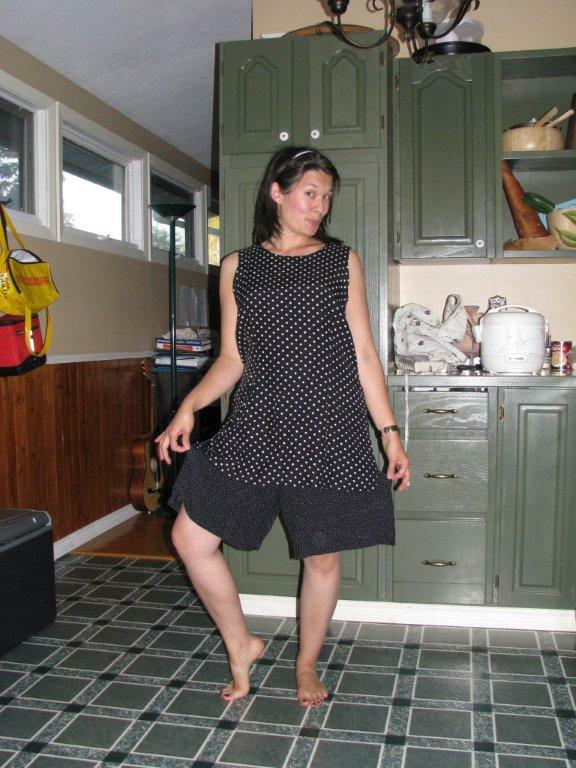 Check the attached shorts with different polka-dot pattern. Hotness! Sorry I don't show the whole thing, but rest assured the shorts are gonzo! New neckline with white insert (material leftover from my wedding dress! ), hot-fix rhinestones to add sparkle, and a red sash to add some Christmas flair. My mom arrived in Whitehorse on Thursday and my dad got here this morning. I made homemade hand cream to use on the girls and to give away as gifts. I made earrings for Jade’s teachers, and a beach glass pendant / Christmas ornament for a neighbour who has helped us out countless times. And now I’m about to take off for Vancouver and arrive home just in time to cook the big family dinner and do Christmas mass. Oh my. Yes, I am still breathing. But I think I will breathe just a little easier on Christmas morning. That is some amazing upcycling. And great job on the gig! Sounds like an amazingly busy month. 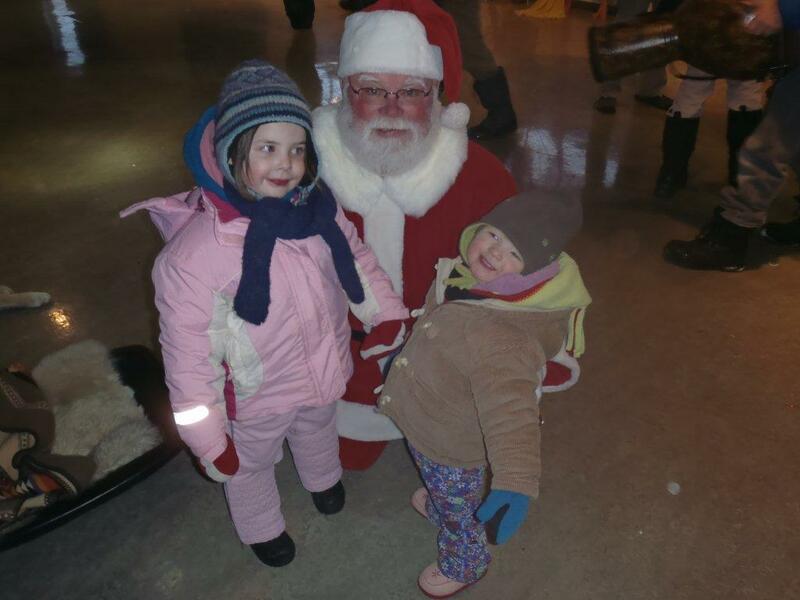 I love the picture of Jade and Halia with Santa! You are freakin’ awesome! I love the changes you made to the short/top set! lol! The shirt is fantastic! And love love love the looks on the girls’ faces as they pose with Santa. Makes me wish I’d done the whole Santa thing with Gabi (oh well). Merry Christmas!! Love the dress. Your month sounds like it’s been just as crazy as mine. Let’s both hope things slow down a bit over the holidays! Well, I’m impressed! Thanks for giving us the skinny on your December! Beautiful! I hope you’ve had a great Christmas! I sure wish I could sew. It was the only class I almost failed in. Oh well. I love the outfit, anyway. It’s going to be -30 here this weekend too. I don’t plan on leaving the house.